Discover the freedom to create again. The world needs you to shine. Creativity is a gift from God to each of us—including you. Is a message weighing on your heart or stirring in your soul today, but you're wondering how to communicate it? 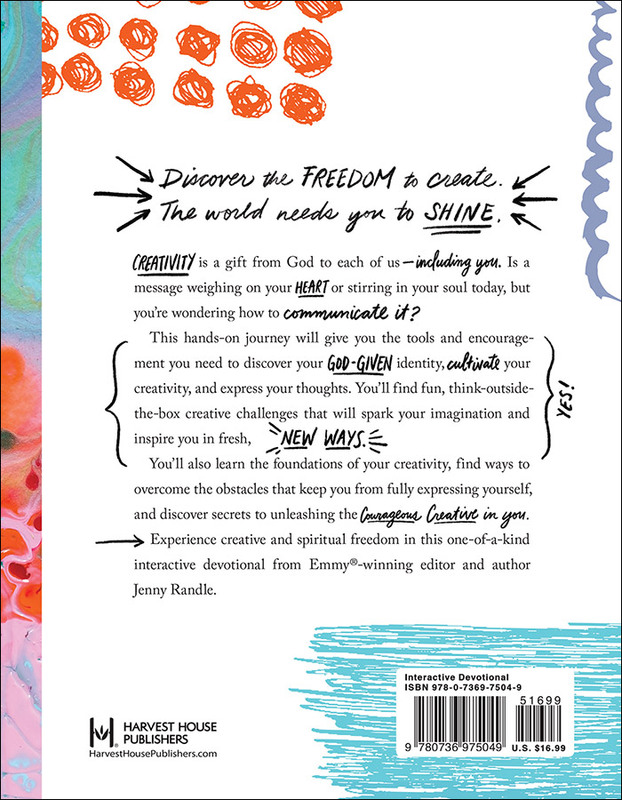 This hands-on journey will give you the tools and encouragement you need to discover your God-given identity, cultivate your creativity, and express your thoughts. You'll find fun, think-outside-the-box creative challenges that will spark your imagination and inspire you in fresh, new ways. You'll also learn the foundations of your creativity, find ways to overcome the obstacles that keep you from fully expressing yourself, and discover secrets to unleashing the courageous creative in you. Experience creative and spiritual freedom in this one-of-a-kind interactive devotional. "I love how Jenny walks us through creative prompts that lead to places of inspiration inside us. Courageous Creative is a near-perfect spark for out-of-the-box thinkers and creators—and for anyone looking for creative moments in dormant areas of everyday life. From mind maps and coloring outside the lines to capturing photos with your point of view, it helps a creative journey truly flourish. Plus, it's just old-fashioned fun!" "It's time to let go of the things that limit our ability to dream with God and to listen as the Holy Spirit empowers us to create and bring glory to Christ. Courageous Creative speaks the truth into your creative process—and provides loads of fun. Jenny's book will awaken your childlike wonder and challenge you to dream again!" "Courageous Creative provides a biblical view of your creativity and empowers you with the truth that you are creative! You were made to make stuff that brings glory to your Creator. Jenny helps you uncover your creativity and live it out amid life's chaos. This book spoke deeply to me and uncovered what I didn't know was hidden in the corners of my heart. Now I'm pursuing painting after years of thinking I was no good at it, and I'm using my God-given creative gifts in my business without fear or timidity. This book is such a gift to the world!" "I absolutely love this book! As an artsy storyteller, Jenny helps you unearth areas you've never explored in a fun way. You'll look forward to trying each new activity and exploring more of the creative side of God along the way." "Everyone can be creative. Every. Single. Person. Most of us just need a nudge in the right direction—and Courageous Creative is that nudge. It's a devotional, inspirational guide, instruction manual, and activity book all rolled into one fun package. If you want to stretch and develop your creative muscles, this is the tool for you." "Freedom often finds us through a song lyric or words spoken from a stage or written in a book. Our creativity makes space for life-changing moments to happen in people. That's why this book is so important. Jenny reveals the deeper things that kill our creativity, and she empowers us to become more creative along the way. Courageous Creative is a must-have book to spark your creative soul." "This book will make you laugh out loud and challenge you to be more creative than you have before. Jenny is the new best friend you've been searching for. She will remind you what it was like to be creative before your brain got in the way." "With a funny, inspiring, and 'I feel like she's talking to me' kind of narrative, Courageous Creative is an interactive journey that breathes new life into our creative bones. Jenny's prompts, mixed with truth from the Word of God and deep revelations uncovered by one who has spent time in His presence, left me feeling free to be who I was designed to be. Jenny inspires and encourages you to walk in your true identity and to let your creativity blossom. Courageous Creative helped me to return to a childlike place of creating by remembering the joy that comes with imagining and playing with God. I know you will love this tool as much as I have!" 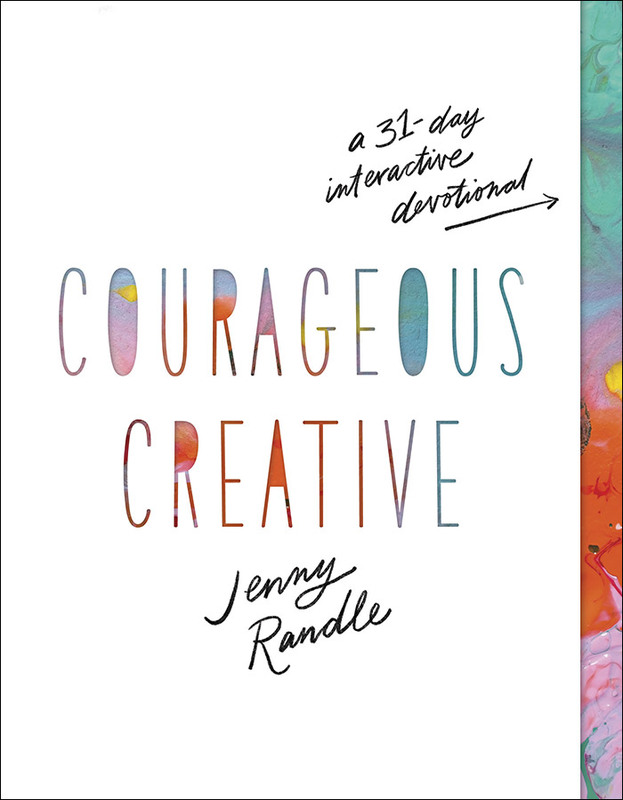 "I picked up Courageous Creative because I'm a fan of Jenny Randle. I knew her book would be gorgeously crafted, because I follow her work. I also knew this would be a fun, entertaining, and inspiring journey. What I wasn't prepared for is how empowering the challenges in Courageous Creative would be. When I think of creatives, I think of artists, graphic designers, performers...people with talents I do not have. Yet this book is a beautiful reminder that God has called and equipped all of us to create. Jenny, well done." "Less of a book and more of an experience that draws you closer to God in the middle of the journey... I recommend it for anyone who wants to be more creative in their journey of faith!"